Have you ever wondered about chakras? It’s kind of a cool concept and can help you process things and deal with life a bit better when you understand and heal any chakras that might be out of balance. Chakras are the centers in our bodies in which energy flows through. Both you and your horse have chakras. We share 7 chakras but animals have an additional one that we don’t have. Each chakra is associated with an Earth element and a color. Chakras are the channels for the flow of Universal energy (Prana, Chi, Ki). This energy flows two ways; inward and out of the body. Therefore, every thought, act and emotion affects the chakras. Likewise, external stimuli, both positive and negative, have an effect on the chakras and leave their mark. This is the same for animals and humans alike. Blocked energy in any of the chakras can contribute to pain, illness and influence mood so it’s important to understand what each chakra represents and what we can do to keep this energy flowing freely. Horses share seven Major chakras with humans; Crown, Third Eye, Throat, Heart, Solar Plexus, Sacral and Root, but animals have another called the Brachial chakra. Another difference is that animal chakras are aligned horizontally instead of vertically. Crown Chakra is the highest chakra and relates to our ability to be fully connected spiritually. It is located on the very top of the head. It deals with the emotions of inner and outer beauty, our connection to spirituality and pure bliss. Color: Violet or white / Element: Thought. The 8th chakra that humans don’t have but animals do is the Brachial chakra. It is located on either side of the body, in the area of the shoulders. It is the main energy center in all animals and links directly to all other chakras. It is the center which relates to animal-human interaction and any healing should always begin at this chakra. At any given time a chakra (energy) can be blocked and out of balance. The chakra will need healing. There are many ways to do this but here is a quick guide to get you started. Sing wherever and whenever you can- in the shower, in your car, while you’re grooming your horse! 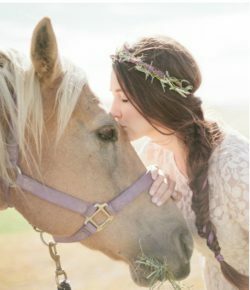 The unique 8th chakra in the horse, the Brachial chakra, can be healed with increase loving contact with humans using positive affirmations and healing hands such as massage and or Reiki if it will allow. You can also spend time in nature with the animal just sitting quietly with no agenda except sending love. Some people might want to say that chakras are “too hippie” to embrace but I say I’ll take all the information (and help) I can get to live a happy, horsey, healthy life!